Christine Muscat: Magdalene Nuns and Penitent Prostitutes. Valletta, BDL Publishing, Malta 2013, 255 pp. For many years after the war, the church of the Magdalene in Merchants Street, Valletta, experienced an ignoble existence, even serving at one time as a garage for carnival floats. Very few of the people who ventured in the area were conscious of the fact that the church had an extremely distinguished past. In pre-war years, the church had served Roman Catholic soldiers stationed in Fort St Elmo, as well as Navy families from the Camerata barracks across the road. Yet, the modern primary school built next to it, of dubious architectural merit itself, occupied the site of what was in the past the largest and richest of Valletta’s nunneries, which had fallen victim to fascist bombs. Today, the church has been cleared and partly restored. Its charming Baroque interior is a jewel that is crying out loud for more regular utilisation as a cultural venue as to be better appreciated by everyone. Behind the church and the nunnery there lies a most intriguing story that has been told in a fully-documented way only now by Christine Muscat. 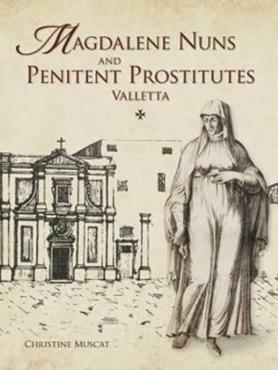 Muscat’s Magdalene Nuns and Penitent Prostitutes, Valletta is an extensively-researched, generously-illustrated book. It is also excitingly rich in anecdotes that make for a fascinating read, even for the non-specialist. The book started off as a doctoral thesis, but was extensively re-written in a lighter way that makes it particularly attractive for the reader. The Magdalene nuns of Valletta enjoyed a history of 203 years affiliated to the Order of St John, until it was abolished by the French authorities who must have undoubtedly cast a lascivious eye on its rich holdings. The nuns held considerable holdings in both money and property, passed on them by pious benefactors, legacies and rich foundations. But their wealth was especially derived from the 20 per cent tax that was unfailingly levied on the entire wealth of deceased prostitutes. The convent employed an extremely efficient network of informers to see that such a tax was duly declared and collected. The nuns, apparently, also put their moneys to good use. By the time the order was wound up by the French, the convent was the second largest shareholder in the Universitas, with an investment of 67,000 scudi. It also had investments worth 11,760 scudi with the Massa Frumentaria, while the estates and investments were worth another 150,000 scudi. Mind-boggling indeed. Malta’s status as a cosmopolitan port that also housed a good number of wealthy men forced into statutory chastity, made prostitution quite a lucrative business. Going by many visitors’ accounts, there was never a shortage of local women who ‘fell’, either out of the need to feed their families or else their husbands’ ambition to obtain some good position in the order’s administration. Moreover, there was also a ready supply of imported beauties from all the corners of the Mediterranean and beyond. The nicknames of some of the prostitutes mentioned in the text testifies to the various nationalities of such women. Within its walls, the nunnery provided a cloistered existence for several nuns who were to look after repented prostitutes, as well as for girls in danger of falling into evil ways. There was also room for single mothers, witches, widows, destitute women and even prisoners. It also provided a useful parking area for discarded mistresses of the order’s dignitaries, not to mention a few ones still on active duty, since high walls do not obviously constitute an insuperable obstacle. Among such ‘distinguished’ inmates there was Caterina Vitale, Grand Master De Paule’s lover, who parked her daughter Isabellica there. The wife, mother-in-law, and daughters of the British consul John Dodsworth also found refuge there in 1763. When Pinto was invested as a knight at the age of 24, his companion Resenda Paulucci chose to enter the cloister, which was apparently not so water-tight since he used to invite her regularly to his box at the Manoel Theatre. Paulucci, who became the abbess in 1755, may also have borne him a son (most probably during her convent years) who went on to marry his first cousin, the illegitimate daughter of Pinto’s brother. Monastic life was not, however, just a serene and calm existence and the author was able to document the in-fighting that occurred there. Nuns demanding better food or accommodation, and the right to be consulted when decisions were to be taken, started regular disagreements which often had to be sorted by the authorities. Such behaviour may be expected when a number of women (or men for that matter), some of them quite highly strung, are confined to a small space, and have to face each other till their dying day. Muscat’s assiduous research has enabled her to peer deep into the convent and the problems regularly faced by the cloistered nuns. The youngest girl ever to join the nunnery was a three-year-old whose mother was allowed to raise her within the walls. This was merely one of the cases of the blatant disregard of the rule which barred the introduction of underage novices. Although nuns were not supposed to communicate with the secular world, there must have been cases of illegal communications. Muscat managed to find an unsigned love letter stacked away in a bundle of miscellaneous papers. Written on a small slip of paper, it advises “my dear Giuditta” to exercise more consistently because “lately you have been sitting in your armchair for ever so long”. The writer (a high official of the Order?) says he had known Giuditta for 33 years and swears to be hers unto his last breath. What stories the cloistered walls must have hidden! “It is, however, rather unfortunate to find in a doctoral thesis an inexplicable faux pas that any supervisor or copy editor should have weeded out. The author refers to the author(s) of Malta Illustrata (by Count Giovanni Ciantar who updated Gian Francesco Abela’s Della Descrittione di Malta in the 1770s) as if they were two co-authors writing jointly. It makes no sense to say that “Abela and Ciantar mention an institute for retired prostitutes founded by the knights in 1715” (p. 72). Abela had long been dead and buried in the conventual church by that year. The footnotes and references would also have gained with a little polishing to make them briefer in line with modern editorial practices. The index has a few oddities with Pinto, for example, being listed under Fonseca and with dif- ferent headings for Mary Magda- lene and St Mary Magdalene. These last observations should, however, in no way detract from the great merit and attractive qualities of this book and from the very serious and extensive research carried out by the author. This research has truly opened a window on a facet of Maltese history that has unjustifiably been long overlooked. The book is a work of praise-worthy scholarship that should encourage the author to involve herself in more similar research.